Trying to figure out completely erratic readings on my oil pressure gauge. I ordered a NOS sender and it’s still crazy. So I’m wanting to narrow this down. There are two prongs on my sender and somewhere I read that one prong was for the meter and the other prong was for the oil warning light, is that true. If so the changes in pressure would result in changes in resistance to ground for reference. What I wanted to know was is the Oil pressure reading resistance across the two prongs for both the light and meter or is it reading reference of resistance to ground on each with one going for the meter and the other going for the light. Any insight here appreciated. 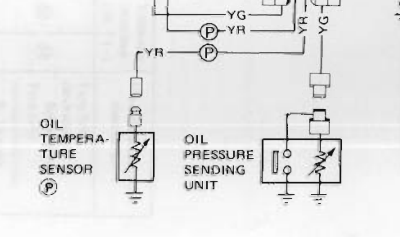 What I wanted to know was is the Oil pressure reading resistance across the two prongs for both the light and meter or is it reading reference of resistance to ground on each with one going for the meter and the other going for the light. Any insight here appreciated. You would measure from prong to ground, for each prong. Edit - that would be with the sender in the block. Otherwise, measure from prong to sender threads. Grounding is through the threads. One will be a switch and the other a variable resistance. Appreciate the feedback. Looks like the variable resistance connector goes to the meter with the changes in resistance to ground results in changes to the oil pressure meter while the other prong goes to the oil light and goes to full ground potential when oil pressure is not present. If that’s correct I at least know how to start testing. Might be the gauge itself, not the sender. There is some voodoo there also. This is from 1978. They stopped describing it in later FSM's. It's not a great description they don't really tell where the voltage regulator part is. They blend the sensor and dash gauge all in to one. But, it might be the gauge.